Piyush Goyal said that Rahul Gandhi lied in Parliament about his purported conversations with the French President, which was swiftly rebutted by Paris. NEW DELHI: Faced with the task of countering allegations of impropriety in the Rafale fighter jet deal with France, the BJP on Friday charged Congress president Rahul Gandhi of indulging in serial lying and spreading falsehood. 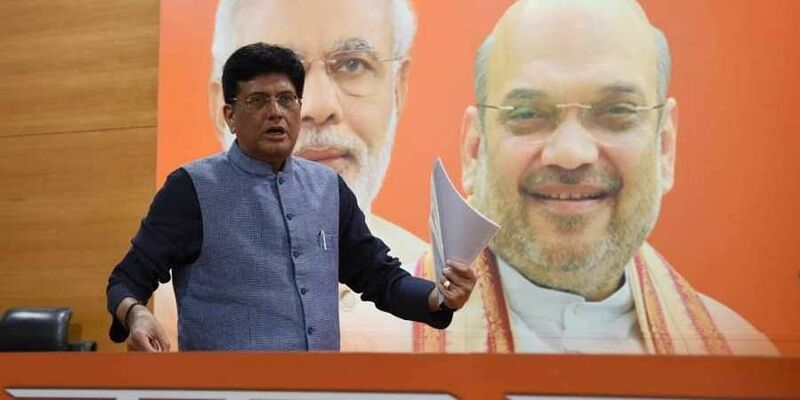 Union Minister Piyush Goyal has accused Gandhi of levelling unsubstantiated allegations against Prime Minister Narendra Modi. Stating that the Congress has no issues to bank on, Goyal said that the Congress president has consistently been lying without showing any regard to the country’s image. The minister said that Gandhi “lied” in Parliament about his purported conversations with the French President, which was swiftly rebutted by Paris. “He has lied about the cost of the Rafale fighter jet. He has shown lack of knowledge about Offset provisions, which were drafted by the UPA government led by the Congress. He’s a serial liar,” claimed Goyal, while adding that the Congress president is seeking to harm the national interests for “petty” political gains. The minister was speaking to reporters after Dassault Aviation claimed that Anil Ambani-led Reliance has been selected by the company on its own only for 10 per cent of the total offset cost even while the aviation company is in talks with many other Indian companies for other works. Goyal claimed that Gandhi has launched a campaign of falsehood to cover up the “misdemeanour of 2012, when the negotiations with Dassault was cancelled under the pressure of the first family of the Congress”. The minister stated that the government gave utmost priority to national security to ink the Rafale fighter jet deal by negotiating better prices. Goyal stated that the comparison of a fully equipped fighter jet with just a jet is misplaced as it would amount to comparing seeds with orchards. He stated that the CEO of Dassault Aviation has affirmed that the company on its own had chosen Reliance as its Offset partner. “The statement of the CEO of Dassault has again exposed the lies of Gandhi,” said Goyal. The minister added that a falsehood cannot become truth even if it’s repeated 100 times.